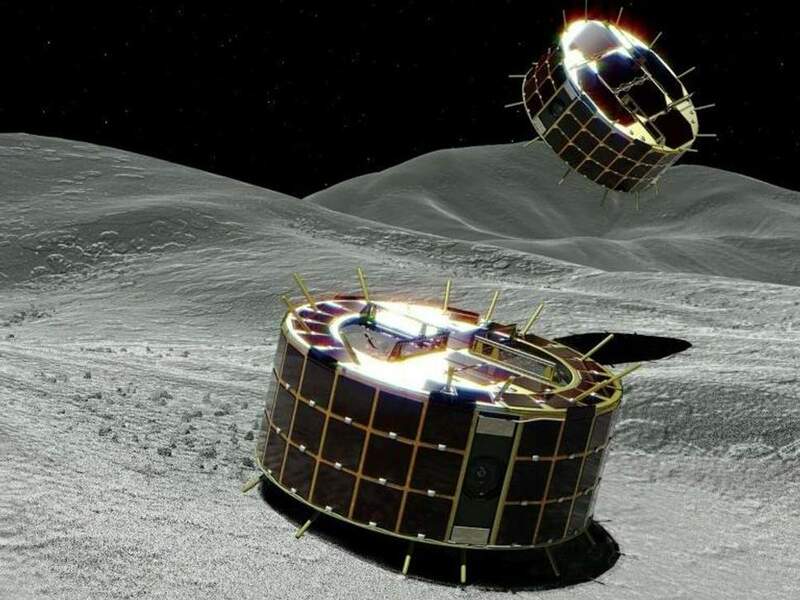 Reports are confirming that the Japanese space agency has successfully landed two hopping robots on an asteroid in our solar system. Japan's Space Agency has successfully landed two hopping robots on the surface of an asteroid. | Image courtesy of JAXA. The first of two Japanese space hopping robots just succeeded a historic landing on the asteroid Ryugu to bring samples of this relic of the solar system’s early days. In December 2014, the Japan Aerospace Exploration Agency (JAXA) launched a spacecraft called Hayabusa2. Destination: asteroid 162173 Ryugu. Last June, after a perilous journey of 3.2 billion kilometers, Hayabusa2, the asteroid explorer, safely reached its target. Now, the spacecraft has deployed the first of the two small MINERVA-II robots, the second generation of “MIcro Nano Experimental Robot Vehicle for Asteroid” landers. Hayabusa2 has successfully deployed MINERVA-II 1a and MINERVA-II 1b, and they’re already hopping around on Ryugu’s surface. The two hopping robots are tiny cylindrical robots measuring 7 by 2.8 inches and weighing a little over two pounds. Wheels aren’t an option on the rugged terrain of Ryugu, so instead, they’ll jump to move around, benefiting from the asteroid’s low gravity. They will take pictures of Ryugu and study its mineral composition. Yesterday, JAXA said in a tweet that it had lost communication with the rovers after they dropped from the spacecraft. The agency attributed this to the rotation of the asteroid. “We are sorry we have kept you waiting! MINERVA-II1 consists of two rovers, 1a & 1b. Both rovers are confirmed to have landed on the surface of Ryugu. They are in good condition and have transmitted photos & data. We also confirmed they are moving on the surface”. Besides this historic asteroid landing, JAXA’s mission is the closest ever to asteroid mining. Sometime next year, Hayabusa2 itself is supposed to land on the asteroid to collect samples by creating a crater using a “small carry-on impactor”. The asteroid 162173 Ryugu is named after Ryūgū-jō, a dragon castle in a Japanese folktale, and it literally means “dragon palace castle”. About 900 meters (0.55 miles) in diameter, the asteroid Ryugu is an NEO (near-Earth object), and as such is a potential Earth-impacting body, so the more we know about it and other NEOs of its type the better. Ryugu was initially thought to be almost spherical with some edges, but now we know it’s true shape thanks to Hayabusa2 which took the first direct image of the asteroid from a distance of about 40 km. The Hayabusa2 photos of Ryugu showed it’s more cubic in shape than computer models suggested, and revealed the rugged surface of this asteroid with its multiple craters and rocks. And here’s another closer image, taken September 21 at 13:17 JST, where Hayabusa2 “has finally dropped to about 100m” and captured its own shadow on the surface of Ryugu. The mission objective is to send data and collect samples and bring them back by 2020. JAXA believes Ryugu to be a “Type C” asteroid, which means it’s rich in ice water, gases, and organic materials, which makes it a good place to study the birth of the solar system and the origin of life. However, this isn’t the first mission of such kind. In 2014, ESA’s Rosetta spacecraft, after a 10-year journey through space, reached the comet 67P/Churyumov-Gerasimenko, and dropped a lander (Philae) onto its surface. Unfortunately, due to the comet’s icy surface, Philae settled in a dark spot where there isn’t enough light for it to recharge its batteries, and its mission stopped before it begins. Do you think space mining could be a solution to future resource shortages on Earth?